STAR TREK AT 50: Voyager - Death Wish | Warped Factor - Words in the Key of Geek. Tony doesn’t have a death wish. Yet. One of the simplest reasons science fiction exists is to hold up a mirror to the society that creates it and, by dislocating the circumstances of its storytelling, tackle themes of great importance to that society. In Western societies, there are trends in societal attitudes, moving in particular directions – the trend towards the equality of sexualities has picked up speed in the last ten years; the trend towards the recognition of gender fluidity is hot at the moment. And the trend towards compassion in end-of-life situations is another case where our societies are moving towards what feel like inescapable conclusions – while still, at the moment, the news will show stories of people in prolonged pain or with no dignity in life left being refused the ability to legally put an end to their own suffering, the work of clinics like Dignitas, of individuals like Dr Jack Kevorkian, and of pressure groups like Dignity In Dying push our society towards a legalisation of suicide and assisted suicide in cases where people are terminally ill or suffering in ways we as a society do not think it fair to inflict on them indefinitely. Death Wish, episode 18 of Voyager’s second season, is a coherent mirror, rehearsing the arguments of the human right to suicide in certain circumstances. As mirrors go, it’s an excellently clear example of the form, from a story by Shawn Pillar, because being late twentieth century Star Trek, it has access to the perfect species for exploring the limits of life and death – the Q. An apparently impossible asteroid seems to have a life form at its heart, and Voyager, still stuck wandering the Delta Quadrant, beams the life form on board. It’s a humanoid, an avuncular, easygoing man, who announces himself as Q. Perhaps understandably, Janeway goes immediately to red alert, having read the briefings of Captain Picard on the Q, but it becomes clear early on that this is not the capricious, offensive, dangerously playful god who has occasionally terrorised the Enterprise. This, as it turns out, is one of the most dangerous thinkers the Q Continuum has ever produced – its very own Dr Death, an advocate for self-slaughter when the prospect of eternal life becomes intolerable. 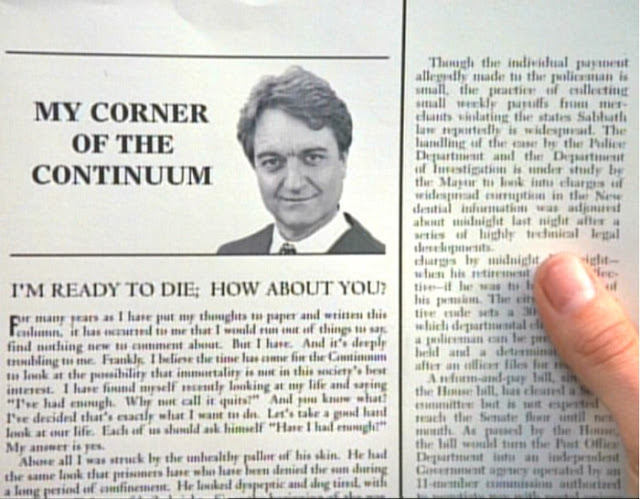 This particular Q’s dangerous nature becomes apparent not so much when he accidentally gets rid of all the men on board as when the more familiar, sneering and staggeringly offensive face of Q, the magnificently superior John DeLancie, turns up to accuse him of crimes against the Continuum. DeLancie’s Q is practically a written device for stealing scenes and puncturing pomposities by applying his own, and yes, absolutely, here he’s in great form, being sensationally sexist to Captain Kathryn Janeway – which doesn’t seem like a very sensible thing for someone actively advocating against suicide to be. This being the first encounter the USS Voyager has had with the Q Continuum in person, you have to forgive the episode a little toing and froing as the two Q chase each other down through time, space and scale – going back to the formation of the universe, hanging Voyager off a Christmas tree and so on – in order to avoid or engineer their confrontation. 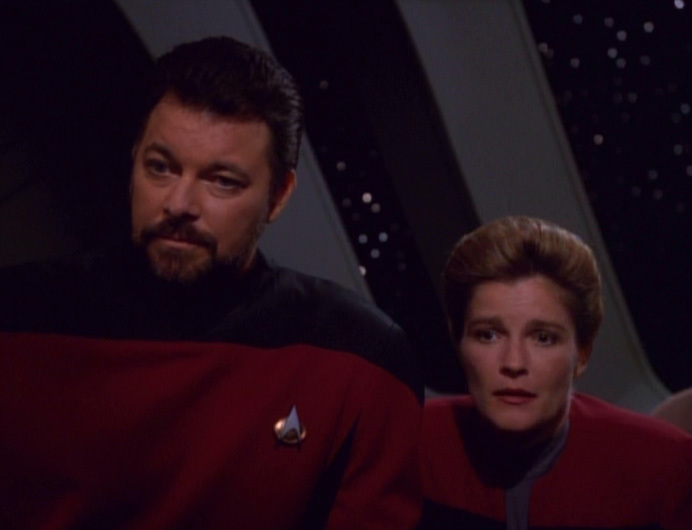 Once Janeway has scowled them both into submission though, the meat of the episode really gets juicy – the new Q, who for reasons of differentiation is known as Quinn, wants to kill himself, but cannot bear to be incarcerated again at the command of the Q Continuum. He demands asylum on board Voyager, and a hearing to determine his right to kill himself. And so we have our battleground of ideas. 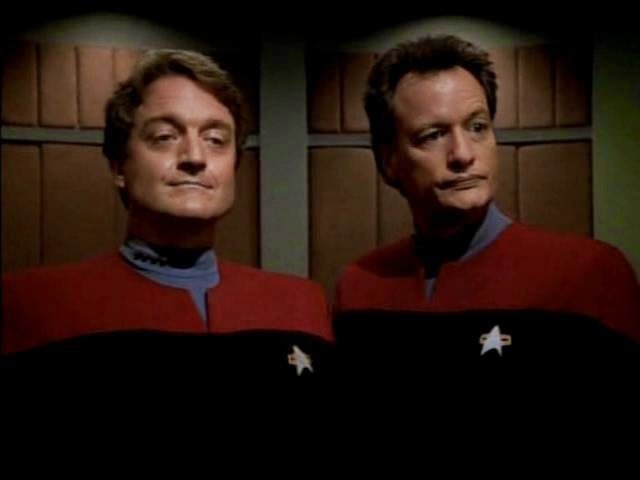 DeLancie’s Q acts as advocate on behalf of the Continuum, while Quinn enlists Tuvok as his representative, with Janeway as judge of the facts. If Quinn is granted asylum, the Continuum must abide by the decision, and the inherent consequences of his suicide. If not, Quinn must allow himself to be re-confined, forced to live in an abject eternity at the Continuum’s pleasure. The arguments that are presented are significant and subtle – we see that Quinn has lived a life of genuine impact, and that his extinction will have the potential of a thousand small but significant events changed, lessened or not performed at all. The idea of gravitation occurring to Newton, the safe performance of bands at Woodstock, the very existence of The Next Generation’s William Riker (with all its consequences), all in some way owe themselves to the presence of Quinn, as do a thousand million other moments in a long life. The message is a strong one – each of us affects our world in as many ways, some small, some large, some that will have ripple effects we cannot even guess at. To arbitrarily cut off our influence in the world is a crime not only against ourselves, but against the universe as a whole for centuries to come. 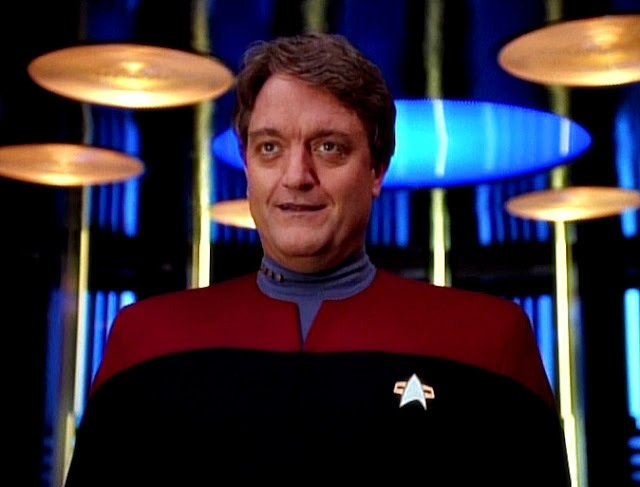 It’s a strong argument in itself, rather undermined by the sleazy nature of Delancie’s Q, who attempts to bribe Janeway to rule in his favour with the promise of an instant return to Earth, the promotion and the ticker-tape parade that would follow that safe return of one of the Federation’s lost ships. But in a way, even the offer underlines the argument – how many more of the Voyager’s crew will die out there in the Delta Quadrant, where her sole decision trapped them in the Caretaker episode? Her life, too, has millions of consequences, and she is being offered the chance to bring her people safely home, simply for doing what she initially feels is right. It takes an extraordinary example to really put Quinn’s life in context. Between them, Quinn and Q together create an analogue of the Q Continuum that the human mind can comprehend – and it is silent. Sterile. Dull. Stultifying. It is a scene with only a handful of active players, and even those have long since stopped being active, so entirely familiar with all the elements of their existence have they become. It’s a powerful rendering of a life that’s done, of a life that is no life. In answer to the fundamental question of why Quinn, with all the advantages of a Q, would want to kill himself, it’s a triumph of showing over telling, a prime example of a life prolonged for the comfort of others at the expense of the individual forced to live it. Moved by the example, Janeway has no choice but to grant Quinn his asylum, allowing him to be rendered mortal, knowing he will probably kill himself but trying against the odds to get him to embrace the challenges of a new adventure – a mortal life among the crew he has chosen. But Quinn reveals there’s more to his suicidal quest than the relief of his own suffering. There’s also the political and philosophical challenge such an act entails to the status quo of the Continuum. A Q being allowed to kill themselves will shake up everything, will open the Q up to new levels of self-questioning, will almost force the Continuum and the individual Q to ask questions for the first time in millennia about what it really means to be a Q. He hopes to leave his people a legacy of both new thought and an alternative to that stultifying eternity. When he dies, it is a fairly simple thing, an almost humble thing, but its effects are far from small. Most immediately, it lights a fire in the DeLancie Q, who, having been a Loki-like, unpredictable prankster, has been chastened by his experiences at the hands of the Continuum, to the point where he has acted as its advocate and persecuted another free-thinking Q. He vows to take Quinn’s free thought strongly on board, to become, if anything, more wild, more capricious, more of a pain in the Continuum’s communal backside than he’s ever been before, inspired more by the self-determination that Quinn has shown than by the strength of his philosophical character. The universe undoubtedly loses a great Q when Quinn takes his own life, and many who knew him will mourn his loss. But in doing what he does, and earning the right to do it, he establishes his own bodily autonomy over the State, saying ‘My life belongs to me, not to you.’ He makes the State admit that every Q’s life is their own to take should they be of sound mind and still want to take it. The lesson of Death Wish has yet to become our entirely accepted societal reality – our own sense of loss, and frequently religious ideas of our lives being on loan from a deity, prevent it from being so. But the trend towards an individual’s bodily autonomy appears unstoppable, and one day, we will look back at Death Wish as a sophisticated science-fiction prophecy of what had to come.